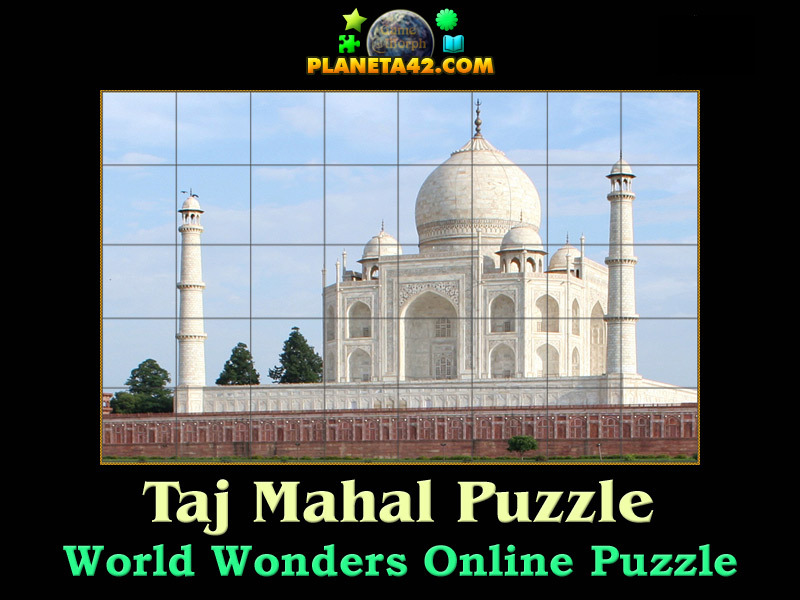 Taj Mahal world wonder in a fun online history puzzle. played in the web browser. Set the picture of Taj Mahal Mausoleum. How does Taj Mahal looks like? How to play Taj Mahal Puzzle. From Wikipedia: The Taj Mahal, meaning Crown of the Palace is an ivory-white marble mausoleum on the south bank of the Yamuna river in the Indian city of Agra. It was commissioned in 1632 by the Mughal emperor, Shah Jahan (reigned 1628–1658), to house the tomb of his favourite wife, Mumtaz Mahal. The tomb is the centrepiece of a 17-hectare complex, which includes a mosque and a guest house, and is set in formal gardens bounded on three sides by a crenellated wall.